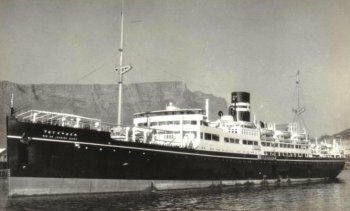 The Rio de Janiero Maru was completed in 1930 as a passenger liner of the O.H.K. line. She carried large numbers of Japanese immigrants to Brazil bewteen 1930 and 1935. Rio de Janiero Maru was requisitioned by the Imperial Navy and and converted to a submarine tender late in 1940. Assigned to Submarine Squadron 5, she was at Cam Ranh Bay when war broke out in the Pacific. She twice survived torpedo attacks in 1942. Converted to a civilian transport in 1943, she carried out at least one voyage as a "hell ship" with prisoners of war crammed into her hold. She was crippled by aircraft on 17 February 1944 at Truk and sank the next day.